Super Stuey Stamp 1 is the city that you're superhero protects. What colour are the buildings? Should you make the windows have the lights on, or dark as if "no one's home"? The choice is yours with this digital stamp. A great creative addition for your card making, scrapbooking, and hybrid scrapbooking projects. 1 Cityline Stamp (2 files - 1 image is a .png file and 1 is a .jpg file format). 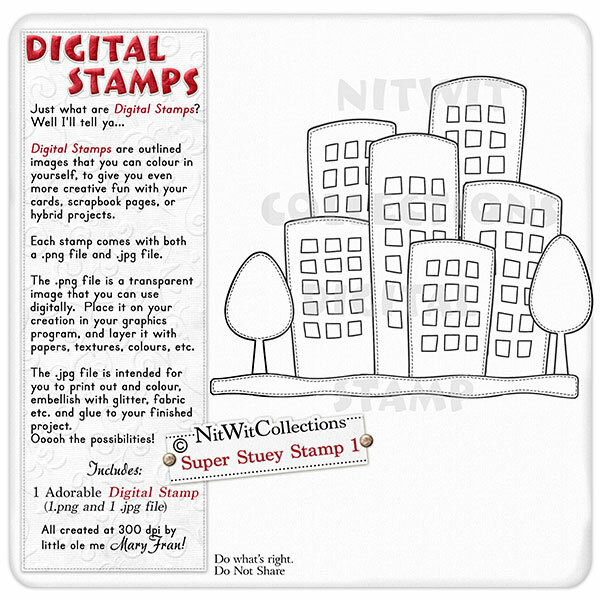 Digital Stamps may be incorporated into a project but are not available for resale by any License holders.